Geeky fanboy Ikumi Saiki has a dream that someday, somehow, he'll finally get a girlfriend. Then one day, on the train home, he rescues a beautiful girl from a troublesome drunk. Now the girl sees the hero inside the otaku—and it appears that Ikumi will finally find romance! But though Ikumi found the courage to save her, will he ever be brave enough to win her heart? Desparate, Ikumi posts an urgent plea on an Internet message board: "Help me with the girl of my dreams!" Ikumi's story ignites the whole online world. Everyone is ready to help Ikumi prove that even an otaku can find true love! This is one of the manga adaptations of the Densha Otoko series, based on the posts of a 23-year-old otaku on the bulletin board 2channel, which spawned a best-seller book, an 11-episode live-action series from July 7, 2005 to October 6, 2005 and a film released in Japan on March 26, 2005 and licensed in DVD by VIZ Media. 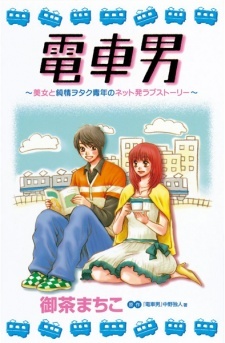 Densha Otoko: Bijo to Junjou Otaku Seinen no Net-Hatsu Love Story was published in English as Train Man: A Shōjo Manga by Del Rey Manga on November 7, 2006. Then theres the girl, and thank your lucky socks shes not one of those kinda girls make you wanna rip the spine open out of frustration. Shes sweet, and not showy at all ! Looking up at my rather high scores, please do be tempted to read Train Man as might just enjoy it as i have ! A journey of a man who thinks he's never capable of having a girlfriend....when one event changed it all! It was a blast reading it, with a few flaws though. Ikumi here simply couldnt picture falling in love, seeing his own status besides being an otaku. Along the way though, all he needs to do is to step up his game, and his journey just kept getting more interesting. -a POV (Point of View) story? The scenes drawn on Ikumi's story is all from Ikumi's point of view, making the journey more realistic because we won't read Mai-chan's point of view at all, which is very helping, for me. -The story itself is just what us loners imagine...so, unrealistic is the con here. The epilogue resulted with what would Mai think of Ikumi's otaku side. Her reaction...iz what I would imagine if I did the same thing. On the other side, it wouldnt be as cute as what Ikumi had. But forget the con. Its the sweetest story I've ever read in a manga. You'll appreciate the ending too.